Cancer genomic profiling can be challenging for patients with limited tissue sample, especially in cancer types such as lung cancer where small biopsy samples coupled with low tumor cellularity are the norm. 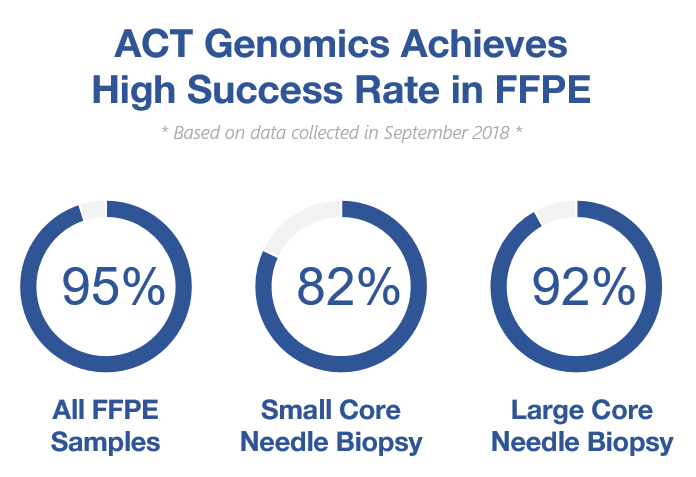 By performing macrodissection and utilizing our expertise in handling FFPE samples, ACT Genomics is able to offer high success rate in FFPE and provide more comprehensive information on copy number variation (CNV) and mutations, with a small amount of specimens. 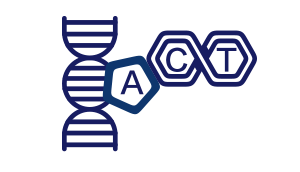 ACTOnco®+ comprehensive genomic profiling, ACT Genomics’ flagship panel, covers tumor mutational burden (TMB), microsatellite instability (MSI) status and immune-related genes to provide a more accurate prediction of ICI responses. In addition to TMB and MSI, ACTOnco®+ also provides genomic alterations of genes known to confer sensitivity or lack of benefit to ICI such as PTEN, STK11, JAK1/2, EGFR, B2M, MDM2/MDM4, PBRM1, SERPINB3, SERPINB4, and antigen processing and presentation genes. For every report, ACT Genomics provides one-on-one report consultation for ordering physician. 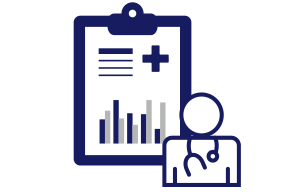 Our user-friendly reports offer clinically significant insights through logically-organized content and intuitive graphics. Find more treatment options for your patients! ACT Genomics panels are designed to support physicians with evidence-based and actionable insights to answer clinical challenges in cancer management. Identifying the genetic alterations harbored in the patient’s tumor and understanding how they affect cancer-related cell signaling pathways to drive tumor growth are the keys to finding suitable treatment strategies for each patient. ACTMonitor® uses circulating tumor DNA (ctDNA) to provide an early detection of cancer recurrence and drug resistance. ctDNA consists of fragments of DNA released from necrotic or apoptotic tumor cells into the blood stream. ACTMonitor® detects the occurrence of variants that would lead to drug sensitivity or resistance, allowing assessment of treatment responses before changes can be observed by protein markers and in radioimages. Approximately 5-10% of cancers are caused by germline mutations. In addition to the well-characterized BRCA1/2, mutations in many other genes also cause a higher lifetime risk of cancer, up to 10-90 times higher than for someone without a mutation. ACTRisk™ is a genetic test that analyzes 32 genes strongly associated with common hereditary cancers. It provides important genetic information that helps physicians and genetic counselors to precisely evaluate cancer risk and discuss risk management options with clients. European Urology. 10 September 2018. According to the results from the phase 2 SUMMIT basket trial, neratinib demonstrated clinical efficacy in patients with metastatic HER2-mutant cervical cancer. According to the results from the phase I NAVIGATOR trial presented at the 2018 CTOS Annual Meeting, avapritinib showed substantial clinical benefit across all lines of therapy for GIST patients. According to a result from a phase 2 study, crizotinib showed positive results in patients with advanced, inoperable inflammatory myofibroblastic tumors. In the phase 2 basket ROAR study, combination of dabrafenib and trametinib demonstrated clinical benefit in patients with BRAF-mutant biliary tract cancer. Combination of trastuzumab, capecitabine, oxaliplatin and pembrolizumab showed promising results in patients with HER2-positive metastatic esophagogastric cancer. We are highly experienced and possess professional high standard procedures in the challenging process of retrieving DNA from FFPE samples for sequencing. Our scientists have optimized the methodology to consistently achieve successful sequencing with highly accurate results. In addition to FFPE samples, our platform also works with core needle biopsies, pleural effusion, ascites, blood samples, and buccal swaps. 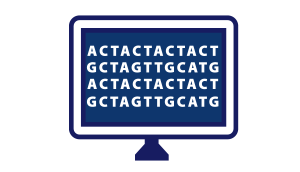 ACT Genomics has established a state-of-the-art next generation sequencing (NGS) platform. Sequencing is performed on Ion Personal Genome Machines, Ion Proton sequencers and Illumina MiSeq; ACT Genomics is an Ion Torrent™ Certified Service Provider. ACT Genomics integrates advanced annotation and visualization tools, coupled with public and proprietary databases to deliver comprehensive and comprehensible reports. With accurate genomic profiling, visualizing genes with alterations in known cancer pathways and providing potential matching cancer targeted treatments from FDA and National Comprehensive Cancer Network (NCCN) guidelines, mutated sub-network in known pathways, as well as references, ACT Genomics aims to deliver a concise, reliable and actionable meaningful clinical report. Does ACT Genomics also provide information about therapeutic implications for chemotherapy or endocrine therapies? Yes. For many patients, we are able to identify genetic alterations which are associated with sensitivity or resistance to chemotherapy or endocrine therapies. This information is included in our clinical reports. Can liquid biopsy (ACTMonitor™) also provide therapeutic information? Why should I provide a tumor sample? Liquid biopsies are best suited to monitor a patient’s tumor burden. Certain genetic alterations that are associated with therapy sensitivity and resistance can also be detected, and this information can provide therapeutic guidance for some patients. However, due to the low tumor DNA proportion in the blood, much information about genetic alterations in a patient’s tumor are lost in liquid biopsies compared to tumor samples. The gene number and exon coverage are limited in those assays, and the detection of copy number alterations remains difficult. For an evaluation of therapeutic choices, tumor samples should be used if available. The NCCN guidelines provide standards for cancer treatment strategies. Why should I suggest patients to use precision medicine to find a suitable treatment? Traditional cancer treatment does not consider results of comprehensive genetic testing. However, scientific and clinical evidence show that guiding therapeutic choices by genetic testing greatly increases the proportion of patients who benefit from the treatment, leading to improved clinical outcomes. Note: There is substantial evidence that precision medicine is improving clinical outcomes for cancer patients. For example, the University of Texas MD Anderson Cancer Center and the University of California, San Diego published data from clinical studies demonstrating that therapy selection based on the results of genetic testing can improve overall survival. Furthermore, the National Cancer Institute (NCI) and the American Society of Clinical Oncology (ASCO) are currently conducting large precision medicine clinical trials to demonstrate that precision medicine leads to improved clinical outcomes. If the test results indicate multiple therapeutic choices, will information about the evaluation of those choices be provided? We will discuss therapeutic options with treating physicians based on data such as gene mutation frequency, affected cancer signaling pathways and the patient’s cancer type. We also provide information about the results of related clinical trials to help with the evaluation of therapeutic choices. For which cancer types can I use ACT Genomics’ services? The test ACTOnco®+ provides comprehensive testing including more than 400 cancer-related genes and can be used for all solid tumor types. Similarly, the panel ACTMonitor™ can be used to monitor the tumor burden of patients with solid tumors. Some other panels or subpanels, such as ACTDrug®+, ACTBRCATM and cancer type specific ACTMonitor™ subpanels, are designed for patients with certain cancer types.